Welcome to Nautical Way! Emerald Coast by Owner is happy to be your premiere vacation rental service for this amazing area! Nautical Way is the perfect place for just about anyone to vacation, and here's why! 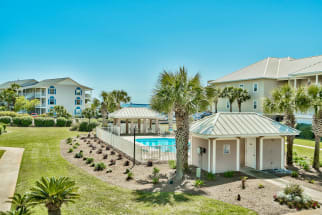 These condominiums are conveniently located right near the beach, just a short trip away, and give you easy access to anything in the area you desire to try! Whether it's a local food joint, an attraction or somewhere to relax, we've got it! IF you're looking to relax on this year's trip, go to a local spa, enjoy an amazing treatment, or layout on your balcony or the beach! Want to spend this year's vacation jam packed with fun activities Not a problem! Holiday Isle can be a blast for anyone, there's so many attractions to choose from! You can go parasailing, deep sea fishing, paddle boarding, jet ski rentals, boat tourism, golfing and so much more! Now when it comes to the food here in Holiday Isle, you don't want to miss a meal. There's a number of delicious seafood eateries throughout the area, ranging from high class to just a fun food joint! Two places you can't miss out on are AJ's Seafood and Oyster Bar and Bistro Bijoux! Book your next vacation to the beautiful Nautical Way in Holiday Isle, Florida. Visit Emerald Coast by Owner today and view hundreds of different listings! When you book with Emerald Coast by Owner, we make it easy for you to choose where, when, and what you want to do on your trip. Contact us with any questions!